From time to time I like to check in with my favorite Southern vintage shops. So for today's vintage roundup, I'm adding a bit of everything that just happened to catch my eye today. 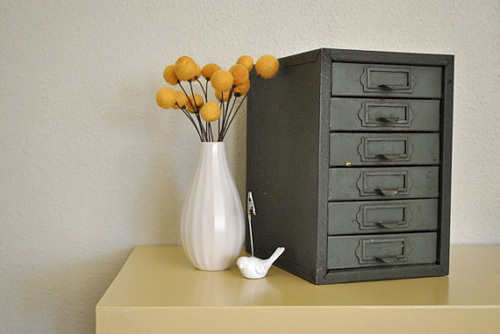 Above is a wonderfully versatile steel army green parts box. It's from the 1940's and comes via The White Pepper in Lynchburg, Virginia. Wrapping gifts in unusual paper makes me happy. So when I saw this retro birds and flower tissue paper, I just had to share. It comes via Rhapsody Attic in Atlanta. I'm loving the lines and color of this vintage teapot. And oh, how I'd like to own this retro glider in kelly green...such a great addition to a Southern porch. At top left, we start with a butternut colored mid-century ottoman with a shelf. It's blemish free and in excellent condition. There has to be a fun use for these old cash register price flags, via Vintage Seventy Five of Milton, Delaware. I'm thinking of buying this old shop doorbell from Raw Vintage of Acworth, Georgia. May work perfect for my front or back porch door...and I'm liking this stack of suitcases that would be lovely just like this- as an end table or their very own art piece. I'm seeing a lot of the old glass insulators lately, either as pendent lights or as decor pieces. These are especially cool and full of character, via the lovely Tammy of Cloth and Patina in Florida. Tom Laurus has such a great eye and I love to peruse his site whenever I can. He never disappoints, as with this gorgeous art deco desk lamp from the 1930's, made by the Keystone Lamp Co. And wow, how fun and classic is this Remington noiseless, portable typewriter, also from the 30's. As Tom explains, "Writers of the day appreciated this machine for its fast, effortless typing and the luxury of quiet operation." This would look so great atop an old wooden desk. Mr. Laurus is also offering this incredible Frederick Weinberg stool (set of 4) that I'm just lusting over. I'm also a fan of these retro blue suitcases and actually found the top one at a yard sale for $2- and get compliments every time I use it. It's roomy, durable and I'll never get sick of the color. I have no particular use for pink and white buttons at the moment, but I bet this will offer someone else a little inspiration. Aren't they just pretty and fun? I recently bought a ruffle plate from Anthropologie with a bumble bee on it that I just love...which makes me now crave these pink crinoline ruffle plates and saucers from the 1950's. Both these offerings come via Quite Right Slick of east Tennessee.